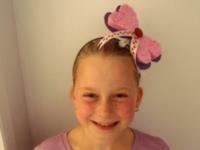 This bow can adorn a bowtie for boys or a headband for girls. 1. Gather your material. 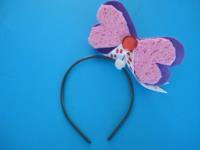 You will need a plastic headband, purple felt, a pink sponge, scissors, a small clothespin, white and/or hot glue, ribbon, and a red button. 2. 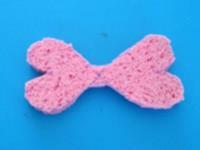 Cut a bow shape out of the pink sponge. 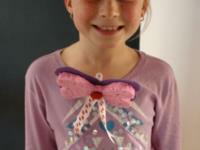 Help children notice how each side of the bow has a heart shape. 3. 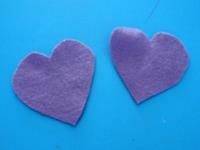 Cut two heart shapes out of the purple felt. 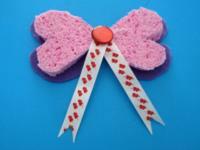 They must be slightly bigger than the hearts at each end of the sponge/bow. 4. 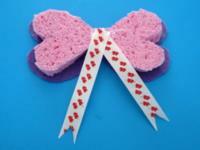 Glue the felt hearts under the bow as shown. 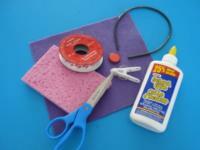 Cut two pieces of ribbon and glue them in the centre of your bow. If you wish, cut a slit at the end of each ribbon. 5. 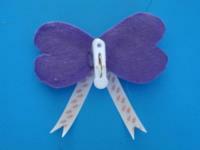 Glue the button in the centre of your bow, on top of the ribbon pieces. 6. Turn your bow over and glue the small clothespin in the centre of your bow. 7. Boys will like to wear their bow as a bowtie for your Valentine's Day Ball. In afterthought, I think using a longer clothespin and gluing it closer to the bottom of the bow would result in the bowtie standing straighter. 8. Little girls can simply attach the clothespin to a plastic headband to create the perfect hair accessory for the Valentine's Day Ball.